This article is about the influence the United States of America has on the culture of other countries. For other uses, see Americanization (disambiguation). 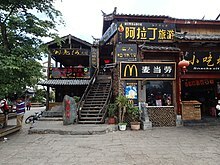 A McDonald's in China. McDonald's is widely seen as a symbol of Americanization. In countries outside the United States of America, Americanization or Americanisation, is the influence American culture and business have on other countries, such as their media, cuisine, business practices, popular culture, technology or political techniques. The term has been used since at least 1907. While not necessarily a pejorative term, it is most often used by critics in the target country who are against the influences. Americanization has become more prevalent since the collapse of the Soviet Union in 1989–91, and especially since the advent of widespread high speed Internet use starting in the mid-2000s. In Europe, in recent years there is growing concern about Americanization through Google, Facebook, Twitter, Amazon, Apple Inc. and Uber, among many other United States tech industry companies. European governments have increasingly expressed concern regarding privacy issues, as well as antitrust and taxation issues regarding the new American giants. The Wall Street Journal in 2015 reported "deep concerns in Europe’s highest policy circles about the power of U.S. technology companies." Within the United States, the term Americanization refers to the process of acculturation by immigrants or annexed populations (e.g. the Californios) to American customs and values. Hollywood (the American film and television industry) since the 1920s has dominated most of the world's media markets. It is the chief medium by which people across the globe see American fashions, customs, scenery and way of life. In general, the United States government plays only a facilitating role in the dissemination of films, television, books, journals and so on. However, during the occupation of former Axis enemies countries after World War II, the government played a major role in restructuring the media in those countries to eliminate totalitarianism and promote democracy, against communism. For example, In Germany, the American occupation headquarters, Office of Military Government, United States (OMGUS) in 1945 began its own newspaper based in Munich. Die Neue Zeitung was edited by German and Jewish émigrés who fled to the United States before the war. Its mission was to destroy Nazi cultural remnants, and encourage democracy by exposing Germans to how American culture operated. There was great detail on sports, politics, business, Hollywood, and fashions, as well as international affairs. Americanization would continue to spread out over the Iron Curtain even before the fall of the Soviet Union and periodically after. Copies of American-based TV programs are re-broadcast around the world, many of them through American broadcasters and their subsidiaries (such as HBO Asia, CNBC Europe and CNN International). Many of these distributors broadcast mainly American programming on their TV channels. In 2006, a survey of 20 countries by Radio Times found seven American shows in the ten most-watched: CSI: Miami, Lost, Desperate Housewives, The Simpsons, CSI: Crime Scene Investigation, Without a Trace and The Adventures of Jimmy Neutron: Boy Genius. American films are also extremely popular around the world, often dominating cinemas as a result of a high demand of US product exported to consumers to clear away the outlook of World War II. Out of the top-50 highest-grossing films of all time, all of them were made entirely or partially in the United States. Often part of the negotiating in free trade agreements between the U.S. and other nations involves screen quotas. One such case is Mexico, which abolished screen quotas following the establishment of the North American Free Trade Agreement (NAFTA) with the U.S. Recently South Korea has agreed to reduce its quota under pressure from the U.S. as part of a free trade deal. Many U.S.-based artists, such as Elvis Presley and Michael Jackson are recognized worldwide and have sold over 500 million albums each. Michael Jackson's album Thriller, at 100 million sales, is the best-selling album of all time. Through the study of vocabulary and spelling of English words in books and tweets, American English is more common in communities in European Union compared to British English. This trend is more apparent in the events following World War II and the fall of the Soviet Union. A kosher McDonald's in Ashkelon, Israel. Of the top ten global brands (2017) by revenue, seven are based in the United States: Apple Inc., Google, Microsoft, Coca-Cola, Amazon (company), Facebook and IBM. Coca-Cola, which previously held the top spot, is often viewed as a symbol of Americanization, giving rise to the term "Coca-Cola diplomacy" for anything emblematic of America's soft power. Fast food is also often viewed as being a symbol of U.S. marketing dominance. Companies such as McDonald's, Burger King, Pizza Hut, Kentucky Fried Chicken and Domino's Pizza among others have numerous outlets around the world. Starbucks Coffee in Xi'an, China. Burger King in Ankara, Turkey. Many of the world's biggest computer companies are also U.S.-based, such as Microsoft, Apple, Intel, HP Inc., Dell and IBM, and much of the software bought worldwide is created by U.S.-based companies. Carayannis and Campbell note that "The USA occupies, also in global terms, a very strong position in the software sector." By 1900 observers saw "Americanization" as synonymous with progress and innovation. In Germany in the 1920s, the American efficiency movement was called "rationalization" and it was a powerful social and economic force. In part it looked explicitly at American models, especially Fordism. "Rationalization" meant higher productivity and greater efficiency, promising science would bring prosperity. More generally it promised a new level of modernity and was applied to economic production and consumption as well as public administration. Various versions of rationalization were promoted by industrialists and social democrats, by engineers and architects, by educators and academics, by middle class feminists and social workers, by government officials and politicians of many parties. As ideology and practice, rationalization challenged and transformed not only machines, factories, and vast business enterprises but also the lives of middle-class and working-class Germans. Department stores threatened the more local businesses, with low prices and chain-managed stores. The small businesses were determined and fought back to protect their source of income from the U.S. market. Koç University one of the top universities in Turkey is based on the American model. The university also has an American football team, the Koç Rams. During the Cold War, the Americanization was the method to counter the processes of Sovietization around the world. Education, schools, and universities in particularly, became the main target for Americanization. However, the resistance to Americanization of the university community restrained it. During the 15 years from 1950 to 1965, American investments in Europe soared by 800% to $13.9 billion, and in the European Economic Community rose 10 times to $6.25 billion. Europe's share of American investments increased from 15% to 28%. The investments were of very high visibility and generated much talk of Americanization. Even so, American investments in Europe represented only 50% of the total European investment and American-owned companies in the European Economic Community employ only 2 or 3% of the total labor force. The basic reason for the U.S. investments is no longer lower production costs, faster economic growth, or higher profits in Europe, but the desire to maintain a competitive position based largely American technological superiority. Opposition to U.S. investments, originally confined to France, later spread to other European countries. Public opinion began to resent American advertising and business methods, personnel policies, and the use of the English language by American companies. Criticism was also directed toward the international currency system which was blamed for inflationary tendencies as a result of the dominant position of the U.S. dollars. However, by the 1970s European investments in the U.S. increased even more rapidly than vice versa, and Geir Lundestad finds there was less talk of the Americans buying Europe. Americanization has become more prevalent since the collapse of the Soviet Union in 1991. Until the late 1980s, the Communist press could be counted on to be especially critical of the United States. To some extent Russia continued that role under Vladimir Putin and there are similar tendencies in China. Putin in 2013 published an op-ed[clarification needed] in The New York Times attacking the American tendency to see itself as an exceptional, indispensable nation. "It is extremely dangerous", Putin warned, "to encourage people to see themselves as exceptional, whatever the motivation." A new dimension of anti-Americanism is fear of the pervasiveness of American Internet technology. Americanization has arrived through widespread high speed Internet and smart phone technology since 2008, with a large fraction of the new apps and hardware being designed in Silicon Valley. In Europe, there is growing concern about excess Americanization through Google, Facebook, Twitter, the iPhone and Uber, among many other American Internet-based corporations. European governments have increasingly expressed concern about privacy issues, as well as antitrust and taxation issues regarding the new American giants. There is a fear that they are significantly evading taxes, and posting information that may violate European privacy laws. The Wall Street Journal in 2015 reported "deep concerns in Europe's highest policy circles about the power of U.S. technology companies." Berghahn (2010) analyzes the debate on the usefulness of the concepts of 'Americanization' and 'Westernization'. He reviews the recent research on the European–American relationship during the Cold War that has dealt with the cultural impact of the United States upon Europe. He then discusses the relevant work on this subject in the fields of economic and business history. Overall, the article tries to bring out that those who have applied the concept of 'Americanization' to their research on cultural or economic history have been well aware of the complexities of trans-Atlantic relations in this period, whether they were viewed as a two-way exchange or as a process of circulation. Wikimedia Commons has media related to Americanization. American culture in the arts and literature. ^ Azaryahu, Maoz (October 22, 2017). "The Golden Arches of McDonald's: On the "Americanization" of Israel". Israel Studies. 5 (1): 41–64. doi:10.2307/30245529 (inactive March 9, 2018). JSTOR 30245529. ^ Fraser, Nick (November 2, 2014). "How the World Was Won: The Americanization of Everywhere review – a brilliant essay". Retrieved October 22, 2017 – via www.theguardian.com. ^ Beck, Ulrich; Sznaider, Natan; Winter, Rainer (October 22, 2017). "Global America? : The Cultural Consequences of Globalization". Liverpool University Press. Retrieved October 22, 2017 – via Google Books. ^ William Hoynes; David Croteau; Stefania Milan (2011). Media/Society: Industries, Images, and Audiences. SAGE. p. 333. ISBN 9781412974202. ^ Michael Pokorny and John Sedgwick (2004). Economic History of Film. Routledge. p. 25. ISBN 9781134344307. ^ "CSI show 'most popular show in the world'". BBC. July 31, 2006. Archived from the original on September 2, 2007. Retrieved October 23, 2013. ^ Hunt, Michael (2016). The World Transformed: 1945 to the Present. New York: Oxford. pp. 96–108. ISBN 978-0-19-937102-0. ^ "Dual forces fuel Mexican film industry". Adelante. Archived from the original on August 11, 2007. Retrieved August 29, 2007. ^ "Frequently Asked Questions". Elvis.com. Archived from the original on September 26, 2007. Retrieved August 30, 2007. ^ "Jackos Back". MTV. Archived from the original on September 16, 2007. Retrieved August 30, 2007. ^ Gonçalves, Bruno; Loureiro-Porto, Lucía; Ramasco, José J.; Sánchez, David (July 3, 2017). "The Fall of the Empire: The Americanization of English". arXiv:1707.00781 [cs.CL]. ^ "Best Global Brands 2017". ^ "The Coca-Cola Company". NYSE Euronext. Archived from the original on March 3, 2012. Retrieved August 24, 2007. ^ Stead, W. T. (1901). The Americanization of the World. Horace Markley. p. 393. ^ Hunt, Michael H. (2014). The world Transformed: 1945 to the present. New York, New York: Oxford University Press. p. 105. ISBN 9780199371020. ^ Geir Lundestad (2005). The United States and Western Europe since 1945: from "Empire" by invitation to transatlantic drift. Oxford University Press. p. 221. ISBN 978-0-19-928397-2. Abdulrahim, Masoud A., Ali A. J. Al-Kandari, and Mohammed Hasanen, “The Influence of American Television Programs on University Students in Kuwait: A Synthesis,” European Journal of American Culture 28 (no. 1, 2009), 57–74. Campbell, Neil, Jude Davies and George McKay, eds. Issues in Americanisation and Culture. Edinburgh: Edinburgh University Press, 2004. Glancy, Mark. "Temporary American citizens? British audiences, Hollywood films and the threat of Americanization in the 1920s." Historical Journal of Film, Radio and Television (2006) 26#4 pp. 461–84. Hilger, Susanne: The Americanisation of the European Economy after 1880, European History Online, Mainz: Institute of European History, 2012, retrieved: June 6, 2012.